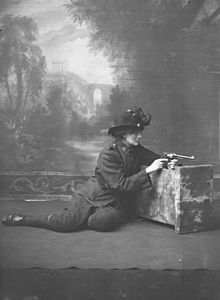 Constance Georgine Markievicz, known as Countess Markievicz (Polish: Markiewicz [marˈkʲɛvit͡ʂ]; née Gore-Booth; 4 February 1868 – 15 July 1927), was an Irish politician, revolutionary, nationalist, suffragette and socialist who served as Minister for Labour from 1919 to 1922. She served as a Teachta Dála for the Dublin South constituency from 1921 to 1922 and 1923 to 1927. She was a Member of Parliament (MP) for Dublin St Patrick's from 1918 to 1922. Constance Georgine Gore-Booth was born at Buckingham Gate in London in 1868, the elder daughter of the Arctic explorer and adventurer Sir Henry Gore-Booth, 5th Baronet, an Anglo-Irish landlord who administered a 100 km2 (39 sq mi) estate, and Georgina, Lady Gore-Booth, née Hill. During the famine of 1879–80, Sir Henry provided free food for the tenants on his estate at Lissadell House in the north of County Sligo in the north-west of Ireland. Their father's example inspired in Gore-Booth and her younger sister, Eva Gore-Booth, a deep concern for working people and the poor. The sisters were childhood friends of the poet W. B. Yeats, who frequently visited the family home Lissadell House, and were influenced by his artistic and political ideas. Yeats wrote a poem, "In Memory of Eva Gore-Booth and Con Markiewicz", in which he described the sisters as "two girls in silk kimonos, both beautiful, one a gazelle" (the gazelle being Constance). Eva later became involved in the labour movement and women's suffrage in Great Britain, although initially Constance did not share her sister's ideals. Gore-Booth decided to train as a painter, but at the time only one art school in Dublin accepted women students. In 1892, she went to study at the Slade School of Art in London, where she lived at the Alexandra House for Art Pupils, Kensington Gore, founded five years before by Sir Francis Cook, a fabulously rich great-uncle of Maud Gonne. One of her contemporaries there was Blanche Georgiana Vulliamy. It was at this time that Gore-Booth first became politically active and joined the National Union of Women's Suffrage Societies (NUWSS). Later she moved to Paris and enrolled at the prestigious Académie Julian where she met her future husband, Casimir Markievicz, an artist from a wealthy Polish family from Ukraine. Markievicz was known in Paris as "Count Markievicz". When Constance's family enquired as to the validity of the title, they were informed through Pyotr Rachkovsky of the Russian Secret Police that he had taken the title "without right", and that there had never been a "Count Markievicz" in Poland. (An online list of counts of the imperial Russian nobility does not include anybody by the name of Markiewicz.) However, the Department of Genealogy in Saint Petersburg said that he was entitled to claim to be a member of the nobility. Markievicz was married, though separated, at the time that they met, but his wife died in 1899 and he and Gore-Booth married in London on 29 September 1900. She was afterwards known as "Countess Markievicz". She gave birth to their daughter, Maeve, at Lissadell in November 1901. The child was raised by her Gore-Booth grandparents and eventually became estranged from her mother. She undertook the role of mother to Stanislas, Casimir's son from his first marriage, who then accompanied the couple to Ireland. The Markieviczes settled in Dublin in 1903 and moved in artistic and literary circles, with Constance gaining a reputation as a landscape painter. In 1905, along with artists Sarah Purser, Nathaniel Hone, Walter Osborne and John Butler Yeats, she was instrumental in founding the United Arts Club, which was an attempt to bring together all those in Dublin with an artistic and literary bent. This group included the leading figures of the Gaelic League founded by the future first President of Ireland, Douglas Hyde. Although formally apolitical and concerned with the preservation of the Irish language and culture, the league brought together many patriots and future political leaders. Sarah Purser, whom the young Gore-Booth sisters first met in 1882, when she was commissioned to paint their portrait, hosted a regular salon where artists, writers and intellectuals on both sides of the nationalist divide gathered. At Purser's house, Markievicz met revolutionary patriots Michael Davitt, John O'Leary and Maud Gonne. In 1907, Markievicz rented a cottage in the countryside near Dublin. The previous tenant, the poet Padraic Colum, had left behind copies of The Peasant and Sinn Féin. These revolutionary journals promoted independence from British rule. Markievicz read these publications and was propelled into action. In 1908, Markievicz became actively involved in nationalist politics in Ireland. She joined Sinn Féin and Inghinidhe na hÉireann ('Daughters of Ireland'), a revolutionary women's movement founded by the actress and activist Maud Gonne, muse of W. B. Yeats. Markievicz came directly to her first meeting from a function at Dublin Castle, the seat of British rule in Ireland, wearing a satin ball-gown and a diamond tiara. Naturally, the members looked upon her with some hostility. This refreshing change from being "kowtowed"-to as a countess only made her more eager to join. She performed with Maud Gonne in several plays at the newly established Abbey Theatre, an institution that played an important part in the rise of cultural nationalism. In the same year, Markievicz played a dramatic role in the women's suffrage campaigners' tactic of opposing Winston Churchill's election to Parliament during the Manchester North West by-election, flamboyantly appearing in the constituency driving an old-fashioned carriage drawn by four white horses to promote the suffragist cause. A male heckler asked her if she could cook a dinner, to which she responded, "Yes. Can you drive a coach and four?" Her sister Eva had moved to Manchester to live with fellow suffragette Esther Roper and they both campaigned against Churchill with her. Churchill lost the election to Conservative candidate William Joynson-Hicks, in part as a result of the suffragists' dedicated opposition. In 1909 Markievicz and Bulmer Hobson founded Fianna Éireann, a para-military nationalist scouting organisation that instructed teenage boys in the use of firearms. At its first meeting in Camden Street, Dublin, on 16 August 1909, she was almost expelled on the basis that women did not belong in a physical force movement, but Hobson supported her, and she was elected to the committee. She was jailed for the first time in 1911 for speaking at an Irish Republican Brotherhood demonstration attended by 30,000 people, organised to protest against George V's visit to Ireland. During this protest Markievicz handed out leaflets, erected great masts: Dear land thou art not conquered yet., participated in stone-throwing at pictures of the King and Queen and attempted to burn the giant British flag taken from Leinster House, eventually succeeding, but then seeing James McArdle imprisoned for one month for the incident, despite Markievicz testifying in court that she was responsible. Her friend Helena Molony was arrested for her part in the stone-throwing and became the first woman in Ireland to be tried and imprisoned for a political act since the time of the Ladies Land League. Markievicz also joined James Connolly's socialist Irish Citizen Army (ICA), a small volunteer force formed in response to the lock-out of 1913, to defend the demonstrating workers from the police. Markievicz recruited volunteers to peel potatoes in a basement while she and others worked on distributing the food. As all the food was paid out of her own pocket, Markievicz was forced to take out many loans, at this time, and sold all her jewellery. That same year, with Inghinidhe na hÉireann, she ran a soup kitchen to feed poor school children. Fashion advice attributed to her was: "Dress suitably in short skirts and strong boots, leave your jewels in the bank and buy a revolver." In 1913 Markievicz's husband moved back to Ukraine, and never returned to live in Ireland. However, they did correspond and he was by her side when she died in 1927. As a member of the ICA, Markievicz took part in the 1916 Easter Rising. She was deeply inspired by the founder of the ICA, James Connolly. Markievicz designed the Citizen Army uniform and composed its anthem, based on the tune of a Polish song. Other accounts place her at City Hall when the policeman was shot, only arriving at Stephen's Green later. It was long thought that she was second in command to Michael Mallin, but in fact it was Christopher "Kit" Poole who held that position. Markievicz supervised the setting-up of barricades on Easter Monday and was in the middle of the fighting all around Stephen's Green, wounding a British army sniper. Trenches were dug in the Green, sheltered by the front gate; however, after British machine gun and rifle fire from the rooftops of tall buildings on the north side of the Green including the Shelbourne Hotel, the Citizen Army troops withdrew to the Royal College of Surgeons on the west side of the Green. The Stephen's Green garrison held out for six days, ending the engagement when the British brought them a copy of Pearse's surrender order. The British officer, Captain (later Major) de Courcy Wheeler, who accepted their surrender was married to Markievicz's first cousin. Markievicz was transferred to Mountjoy Prison and then to Aylesbury Prison in England in July 1916. She was released from prison in 1917, along with others involved in the Rising, as the government in London granted a general amnesty for those who had participated in it. It was around this time that Markievicz, born into the Church of Ireland, converted to Catholicism. In 1918, she was jailed again for her part in anti-conscription activities. At the 1918 general election, Markievicz was elected for the constituency of Dublin St Patrick's, beating her opponent William Field with 66% of the vote, as one of 73 Sinn Féin MPs. The results were called on 28 December 1918. This made her the first woman elected to the United Kingdom House of Commons. However, in line with Sinn Féin abstentionist policy, she did not take her seat in the House of Commons. Markievicz was in Holloway prison, when her colleagues assembled in Dublin at the first meeting of the First Dáil, the Parliament of the revolutionary Irish Republic. When her name was called, she was described, like many of those elected, as being "imprisoned by the foreign enemy" (fé ghlas ag Gallaibh). She was re-elected to the Second Dáil in the elections of 1921. Markievicz served as Minister for Labour from April 1919 to January 1922, in the Second Ministry and the Third Ministry of the Dáil. Holding cabinet rank from April to August 1919, she became both the first Irish female Cabinet Minister and at the same time, only the second female government minister in Europe. [a] She was the only female cabinet minister in Irish history until 1979 when Máire Geoghegan-Quinn was appointed to the cabinet post of Minister for the Gaeltacht for Fianna Fáil. The bust of Constance Markievicz in St Stephen's Green in Dublin. Markievicz left government in January 1922 along with Éamon de Valera and others in opposition to the Anglo-Irish Treaty. She fought actively for the Republican cause in the Irish Civil War, including the occupation of Moran's Hotel in Dublin. After the War she toured the United States. She was not elected in the 1922 Irish general election but was returned in the 1923 general election for the Dublin South constituency. In common with other Republican candidates, she did not take her seat. However, her staunch republican views led her to being sent to jail again. In prison, she and 92 other female prisoners went on hunger strike. Within a month, she was released. She left Sinn Fein and joined the new Fianna Fáil party on its foundation in 1926, chairing the inaugural meeting of the new party in La Scala Theatre. In the June 1927 general election, she was re-elected to the 5th Dáil as a candidate for Fianna Fáil, which was pledged to return to Dáil Éireann, but died only five weeks later, before she could take her seat. Her fellow Fianna Fáil TDs signed the Oath of Fidelity to King George V and took their seats in the Dáil on 12 August 1927, less than a month after her death. The party leader Éamon de Valera described the Oath as "an empty political formula". Markievicz died at the age of 59 on 15 July 1927, of complications related to appendicitis. She had given away the last of her wealth, and died in a public ward "among the poor where she wanted to be". One of the doctors attending her was her revolutionary colleague, Kathleen Lynn. Also at her bedside were Casimir and Stanislas Markievicz, Éamon de Valera and Hanna Sheehy-Skeffington. Refused a state funeral by the Free State government, she was buried at Glasnevin Cemetery, Dublin, and de Valera gave the funeral oration. Seán O'Casey said of her: "One thing she had in abundance—physical courage; with that she was clothed as with a garment." In 2018 a portrait of Markievicz was donated by the Irish government to the House of Commons to commemorate the 1918 Representation of the People Act, in which, some women were allowed the right to vote for the first time. ^ a b Alexandra Kollontai was People's Commissar (Minister) for Social Welfare of Soviet Russia from 1917 to 1918. ^ In 1939, 2-Lt William Wylie KC, the prosecutor, published a dissenting account that she "curled up completely", "never stopped moaning" and cried "I am only a woman, and you cannot shoot a woman. You must not shoot a woman." ^ a b "Countess Markievicz—'The Rebel Countess'" (PDF). Irish Labour History Society. Retrieved 17 December 2017. ^ Rodgers, Rosemary (11 May 2015). "The Rebel Countess". Irish America. June/July 2015. pp. 42–3. Retrieved 22 November 2018 – via issuu. Rodgers, Rosemary (13 May 2015). "The Rebel Countess". Irish America. June/July 2015. Archived from the original on 23 November 2018. Retrieved 23 November 2018 – via Irish America website. ^ "Countess Markievicz (Constance Markievicz)". Centre for Advancement of Women in Politics. Retrieved 6 June 2008. ^ Naughton, Lindie (2016). Markievicz: A Most Outrageous Rebel. Newbridge, Co. Kildare: Merrion Press. p. 37. ISBN 978-1-78537-084-7. Retrieved 22 November 2018. ^ "Constance Markievicz: The Countess of Irish Freedom". The Wild Geese today. Archived from the original on 1998-05-05. ^ Arrington, Lauren (2015). Revolutionary Lives: Constance and Casimir Markievicz. Princeton, NJ: Princeton University Press. pp. 21–2. ISBN 978-1-4008-7418-7. Retrieved 29 March 2016. ^ "Counts of the Russian Empire". The Russian Nobility Association in America. Retrieved 22 November 2018. ^ Arrington (2015), p. 22 (footnote). ^ a b "Constance Georgine Gore-Booth". The Lissadell Estate. Archived from the original on 18 November 2007. Retrieved 8 August 2011. ^ Gore-Booth, Eva, The one and the many, London: Longmans, Green & Co., 1904. Copy with hand-painted illustrations by Constance Markievicz [née Gore-Booth] held in the Manuscripts & Archives Research Library, The Library of Trinity College Dublin. Available in digital form on the Digital Collections website. ^ Anne Haverty, Constance Markievicz: Irish Revolutionary (Liiliput Press: Dublin, 2016), pp. 73-74. ^ Marecco, Anne (1967). The Rebel Countess. Weidenfeld & Nicolson. ^ Townshend, Charles (2006). Easter 1916: The Irish Rebellion. London: Penguin Books. pp. 21–2. ISBN 978-0-14-190276-0. Retrieved 27 March 2016. ^ a b Ward, Margaret (1983). Unmanageable Revolutionaries: Women and Irish Nationalism. London: Pluto Press. p. 78. ISBN 978-0-86104-700-0. ^ Sigillito, Gina (2007). The Daughters of Maeve: 50 Irish Women Who Changed World. New York: Kensington Publishing Corp. p. 87. ISBN 978-0-8065-3609-5. Retrieved 11 May 2014. ^ Markievicz, Constance (c. 1917). A Battle Hymn. Irish Traditional Music Archive. Retrieved 11 May 2014. ^ Matthews, Ann (2010). Renegades: Irish Republican Women 1900–1922. Mercier Press Ltd. pp. 129–30. ISBN 978-1-85635-684-8. Retrieved 22 March 2016. ^ Arrington, Lauren. "Did Constance Markievicz Shoot the Policeman?". Conference of Irish Historians in Britain. ^ Haverty, Anne (1988). Constance Markievicz: Irish Revolutionary. London: Pandora. p. 148. ISBN 978-0-86358-161-8. ^ Ward (1983), p. 112. ^ Millar, Scott (December 2013). "Not for fame or for name". Liberty. 12 (10): 23. ^ McKenna, Joseph (2011). Guerrilla Warfare in the Irish War of Independence, 1919–1921. McFarland. p. 112. ISBN 978-0-7864-8519-2. Retrieved 22 March 2016. ^ "Mauser pistol handed to me by Countess Markievicz when she surrendered to me at the College of Surgeons Dublin in 1916 with Commandant Mallin. H. E. de C. Wheeler. This was presented to me by General Lowe". Catalogue. National Library of Ireland. 1916. Retrieved 5 January 2016. ^ Bunbury, Turtle. "Dorothea Findlater – One Hundred Years On". Retrieved 5 January 2016. Perhaps the most awkward arrest Wheeler made was Countess Markievicz, his wife’s first cousin. ^ a b c Foy, Michael T.; Barton, Brian (2011). The Easter Rising. The History Press. p. 303. ISBN 978-0-7524-7272-0. Retrieved 30 March 2016. ^ Arrington (2015), p. 141. ^ Richardson, Neil (2015). "Chapter 8: Dublin University Officer Training Corps: The Defence of Trinity College Dublin". According to their Lights: Stories of Irishmen in the British Army, Easter 1916. Cork: The Collins Press. ISBN 978-1-84889-214-9. ^ Dowler, Lorraine (2004). "Amazonian Landscapes: Gender, War, and Historical Repetition". In Flint, Colin. The Geography of War and Peace: From Death Camps to Diplomats. Oxford University Press. p. 144. ISBN 978-0-19-534751-7. Retrieved 30 March 2016. ^ "Archives – The First Women MPs". UK Parliament. Retrieved 23 November 2018. ^ McGuffin, John (1973). "Internment – Women Internees 1916–1973". Retrieved 22 March 2009. ^ "Countess Constance de Markievicz". ElectionsIreland.org. Retrieved 22 March 2009. ^ Ward (1983), p. 137. ^ Pašeta, S. (2004). "Markievicz , Constance Georgine, Countess Markievicz in the Polish nobility (1868–1927)". Oxford Dictionary of National Biography. Oxford University Press. Retrieved 17 September 2006. ^ "Constance Georgina de Markievicz". Houses of the Oireachtas. Archived from the original on 23 November 2018. Retrieved 23 November 2018. ^ "BBC's Short History of Ireland". Bbc.co.uk. 1 January 1970. Archived from the original on 20 August 2010. Retrieved 21 August 2013. ^ a b Depuis, Nicola (2009). Mná Na HÉireann: Women who Shaped Ireland. Cork: Mercier Press Ltd. p. 171. ISBN 978-1-85635-645-9. Retrieved 14 May 2014. ^ Levenson, Leah; Natterstad, Jerry H. (1989). Hanna Sheehy-Skeffington: Irish Feminist. New York: Syracuse University Press. p. 452. ISBN 978-0-8156-2480-6. Retrieved 14 May 2014. ^ a b "Death of Madame Marcievicz". Irish Independent. 15 July 1927. ^ "The Late Madame Marcievicz: An Impressive Funeral". Irish Independent. 18 July 1927. ^ Ratcliffe, Susan (2001). People on People: The Oxford Dictionary of Biographical Quotations. Oxford: Oxford University Press. p. 235. ISBN 978-0-19-866261-7. ^ Oireachtas, Houses of the (2018-07-19). "Picture of Constance Markievicz, first woman elected to House of Commons, gifted to UK by Ceann Comhairle – 19 Jul 2018, 11.20 – Houses of the Oireachtas". www.oireachtas.ie. Retrieved 2019-03-04. O'Faolain, Seán (1934). Constance Markievicz. Lawlor, Damian (2009). Na Fianna Éireann and the Irish Revolution- 1909–1923. Marreco, Anne (1967). The Rebel Countess: The Life and Times of Constance Markievicz. Norman, Diana (1987). Terrible Beauty: A Life of Constance Markievicz, 1868–1927. Haverty, Anne (1993). Constance Markievicz: Irish Revolutionary. McGowan, Joe (2003). Constance Markievicz: The People's Countess. Van Voris, Jacqueline (1967). Constance de Markievicz: In The Cause of Ireland. Wikimedia Commons has media related to Constance Markievicz.